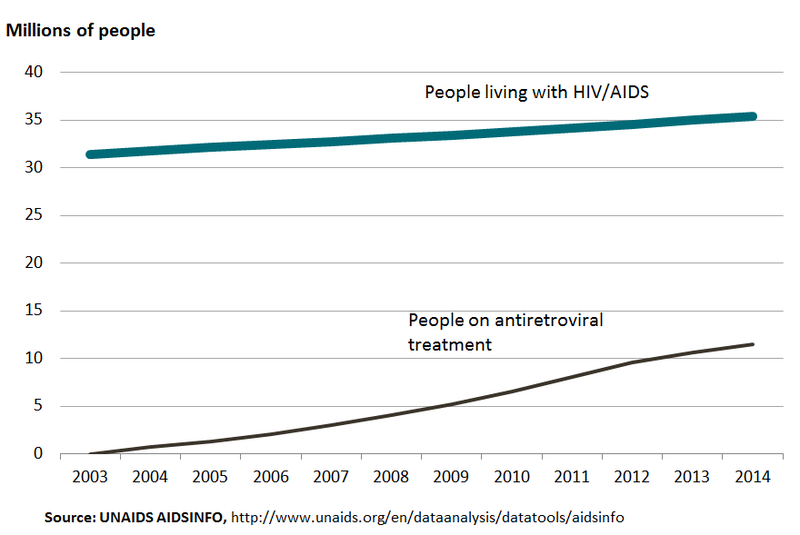 Because treatment extends lives and new infections have persistently outpaced AIDS-related deaths, the number of people living with HIV/AIDS has consequently continued to grow (top line in figure 1). I argued in my 2011 book, Achieving an AIDS Transition, that a unique focus on expanding access to treatment would make recipient countries increasingly dependent on rich ones and would generate unsustainably growing demands for donor resources. The alternative, I proposed, was to focus even more attention and effort on reducing the rate of new infections to below the mortality rate so that the number of people living with AIDS, and eventually the number needing treatment, would begin to decline. This year, in their annual World AIDS Day plea for more resources, UNAIDS is for the first time focusing more on the need to reduce new infections than on treatment expansion. In figure 2 below, we have assembled into one chart the projections UNAIDS shows in figures 6a and 6b of their new “Fast Track” report. 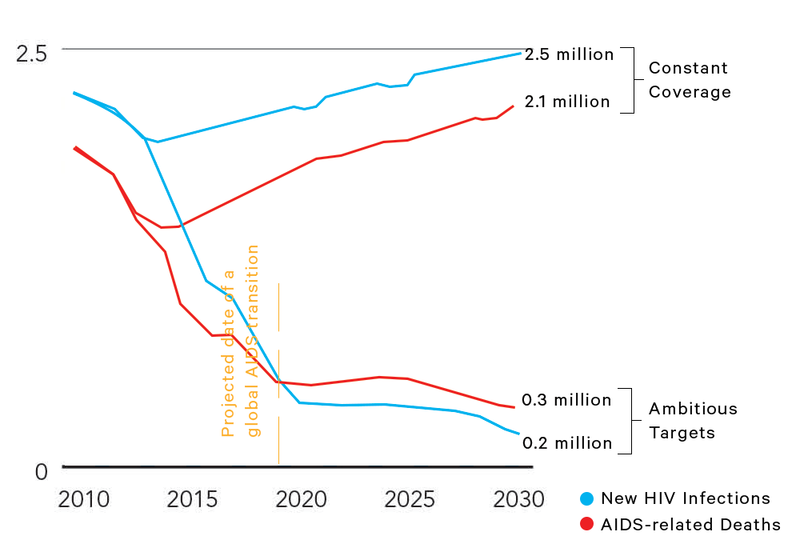 Under their “constant coverage” scenario, new HIV infections will exceed AIDS-related deaths by about half a million persons a year through 2030, causing the number of people living with HIV/AIDS to increase by about 8 million, or to a total of about 43 million (not shown; imagine the top line in figure 1 continuing to climb). This scenario is a dismal one for the AIDS epidemic. With the need for treatment continually climbing and donor commitments for AIDS remaining flat or declining since 2008, AIDS advocates are concerned that the days of unlimited budgets are over. But UNAIDS is urging the world to make one last push. Instead of hoping only for constant coverage, or perhaps failing to sustain even that modest goal, UNAIDS is proposing instead that the world adopt “ambitious targets” by aiming for “zero,” which they define as reducing new HIV infections and AIDS deaths by at least 90 percent by 2030. As figure 2 shows, the ambitious targets would bend both the new infections and the annual deaths dramatically downwards. The “AIDS transition,” a key milestone defined in my book, is passed in 2019 when new infections will for the first time be fewer than deaths and the total number of persons living with HIV/AIDS will begin to decline. Of course, it’s one thing to find a set of assumptions that predict new infections and deaths to go down instead of up (the Futures Institute helped UNAIDS with this meticulous and heroic task). It’s another thing to achieve these ambitious targets. UNAIDS is depending on increased funding of existing interventions to get us to the AIDS transition and beyond. Suppressing mortality to this degree requires greatly expanding treatment to 81 percent of all infected people, and suppressing new infections requires that 90 percent of people on treatment have suppressed viral load. So increased funding will certainly be necessary to reach the AIDS transition. However, as I argue in my book, countries that have been receiving aid to finance their AIDS epidemic will also have to dramatically change their attitudes towards HIV prevention. In addition to deploying the array of available preventive medical technology, including treatment-as-prevention, male circumcision, and needle sharing, affected countries must find new ways to incentivize their citizens to assiduously adhere to AIDS treatment guidelines and to adopt safer sexual practices. Cash transfers to schoolgirls and their families show promise but have not yet been widely adopted. More important might be regional and district-level cash-on-delivery rewards for verified evidence of reductions in new HIV infections. Bravo to UNAIDS for setting a course towards a future when it will no longer be needed—a future without AIDS. Now it must convince donors and recipient countries that this future is realistic and attainable. And that allocating resources towards achieving the AIDS transition is consistent with other sustainable development goals, like universal health coverage and protection from Ebola and other disease outbreaks. The hard work is still ahead.